Honest, transparent circumaural phones that cause little fatigue over long periods. A new favourite in the all-rounder category. Solid sound reproduction at low volumes. Silicon cushion on the headband, though comfortable, will attract sweat. 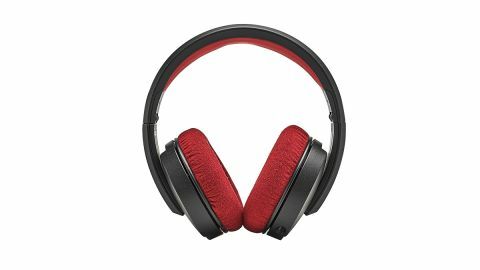 The Listen Professional headphones from Focal represent the only closed-back phones in the French company’s ‘professional’ range, replacing the now defunct Spirit Pros. We were really impressed by the all-round performance of the Spirit Pro phones back then, with, perhaps, the only misgiving being the fit. So we were pleased to see that the design of the Listen Pros has changed somewhat when compared to its predecessor, but of course the proof is in the pudding. Fresh out of the box and we find the LPs neatly encapsulated within a rigid case, which also includes a 5m coiled cable and a 1.4m cable, with omni-directional microphone and remote control. Of course, the obligatory 3.5mm to 6.35mm adapter is present, as is a handy little elasticated strap for your iLok dongle, which is a thoughtful touch. The design differs from the Spirit Pros quite significantly. The headband and hinge looks to be more robust than before and will withstand any twisting, or bending. The folding mechanism differs from the Spirit too, with one cup folding after the other, not at the same time with the earcups pushing against one another, which could damage cones. The overall fit feels like a marked improvement on the Spirits; these are some of the more comfortable phones we’ve tried. This is largely to do with the memory foam earcups, which provide the right density for both comfort and isolation. The headband grip is firm, yet reassuring. The low weight and cup-profile ensure long hours of monitoring and mixing are possible and you wouldn’t bat an eyelid at wearing them out and about. We’re loathe to use the word ‘stylish’... but we just did. Being a closed-back design means you’re not going to get the most expansive soundstage that an open-backed design can provide, but next to its closest rivals, the Listen Pros are honest, direct and the soundstage is very pleasing. Those memory foam earcups aren’t just for comfort and isolation, as Focal have deployed certain materials as acoustic treatment, which further enhances the level of clarity and detail that these headphones provide, leaving you with no unwanted frequencies bouncing around, getting in the way. Reproduction across the entire spectrum is transparent, with plenty of excitement down the low end - the lower mids and bass are both tight and lusciously rich. The Focal Listen Professionals, are exactly what they say on the tin; ideal for both listening and pro duties. As a result, we’d put them firmly in the all-rounder category. Overall, the fit is snug, but not too tight that long periods in the mixing saddle are unbearable. In fact far from it, the longest period of time we had them on continuously was for around three hours - with little discomfort or need for a ‘breather’. While many engineers and audio specialists may prefer open-backed designs for their lack of fatigue, the closed Listen Pros perform admirably in this regard.